Following a sighting of an Asian hornet and the discovery of a nest in Devon, England, this week, British beekeepers are being urged to be on the alert for the invasive and destructive insect. ApiShield, an easily fitted and low-maintenance trap from Vita Bee Health, not only protects honey bee colonies from Asian hornet attack, but it also acts as an early warning of the Asian hornet’s arrival in an area. The Asian hornet is native to China but arrived in a pottery consignment in Bordeaux, France in 2004. Since then the Asian hornets have spread at about 75 km per year across Europe, killing off many honey bee colonies and other native insect pollinators which have no defences to cope with the new predator. 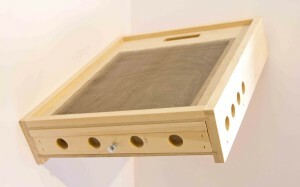 ApiShield, Vita’s patented Asian hornet trap, has been rigorously tested in France and Greece and fools hornets and wasps attacking honey bee colonies into using unguarded underfloor ‘entrances’ not used by the colony’s honey bees. Beekeepers simply inspect the trapped dead and dying predators and look particularly for the Asian hornet. Although designed specifically to trap the Asian hornet, field trials have proved it to be very effective in catching other honeybee pests and predators including wasps, wax moth, and even robber bees that look for easy ways to raid a hive. ApiShields replace existing floors in the autumn and can be easily installed in a very few minutes. 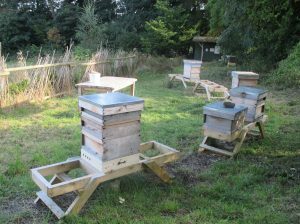 Vita encourages beekeepers, in North Devon especially, to install ApiShields to discover the extent of the current invasion. One ApiShield on one of the less strong colonies in an apiary will act as a good early warning sentinel. ApiShield should be treated with a suitable bee-friendly timber preservative before use. Last year, an invasion appears to have been stopped by the destruction of an Asian hornet nest near Tetbury, Gloucestershire. Vita donated some ApiShield traps to local beekeepers and as yet there have been no further sightings.